Brand new car, the world’s most punishing sportscar endurance race and a GT racing debutant in Tom Kimber Smith into the bargain. The odds were against Team LNT from the very start. That was the bad news. The good news was that Team LNT has already had an entire season of battling against the odds with a pair of TVRs that tested both the team’s resolve and their resourcefulness. 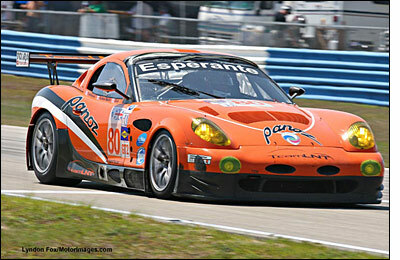 The introduction of no fewer than three Panoz Esperante GTLMs to the Team LNT stable showed that the Lawrence Tomlinson-owned squad was not only ready for another crack at the challenges of international sportscar racing but was again prepared to do so by taking on the established order. They also had the advantage of Richard Dean’s addition to the driving squad. Yorkshireman Dean has been away from his sportscar racing roots for a while but his driving CV includes the 1998 British GT Championship title at the wheel of a Dodge Viper and, in 2001, a win for Panoz in the European Le Mans Series at Vallelunga. Since then he has concentrated on team management, Kimber-Smith being one of his proteges in single seater racing, before joining LNT as Commercial Director at the end of 2005. 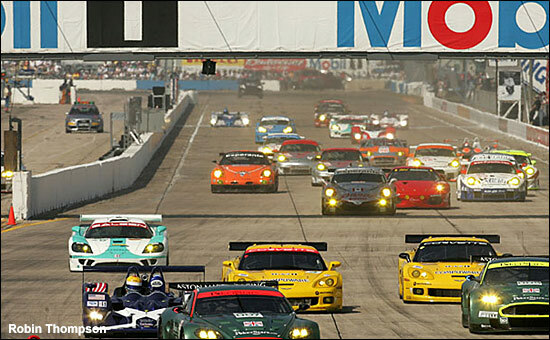 An intensive programme of pre-season testing meant that the crew arrived in Florida thoroughly familiar with the Esperante, but lined up against them were some of North America’s best GT teams - plus the punishing Sebring International Raceway, renowned as a circuit that punishes teams and cars unprepared for its fast and bumpy surface. 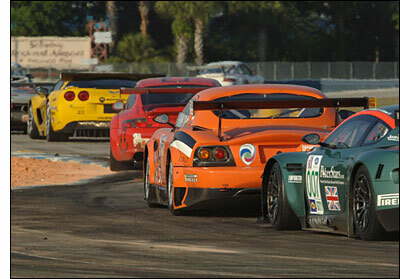 But both Tomlinson and Dean were on the driving strength when the team tackled Sebring at the start of last season. “It’s a car breaker that’s for sure,” said team manager Rodney Farrell. “And the Porsche teams have got proven reliability on their side.” In addition to eight Porsche 911s, many of them from teams with race winning pedigree in the ALMS, there was a gaggle of other challengers from BMW, the Dutch Spyker Squadron and the brand new and formidable Ferrari F430 of ALMS regulars Risi Comptizione. Last, but by no means least, there was the pair of full season ALMS contenders from Multimatic Team Panoz: the bad news for Team LNT is that this team was a highly experienced squad with much experience of the unique challenges posed by the 12 Hours of Sebring. The good news was that they were campaigning a pair of Esperantes and there was much that team LNT could learn from their lead. From the off, with Richard Dean taking the start at 10.43 on Saturday morning (TV schedules dictated the odd timing), the #80 car made progress. Lap one saw the distinctive, bright orange Panoz making up ground and three places on the opposition, the big V8 hammering along the bumpy main straight, hard on the heels of a gaggle of Porsches (above). With the temperatures up close to 90 degrees at trackside, it was going to be a long, hot day’s racing for the Team LNT trio. The game plan was to run hard, fast but most of all reliably. 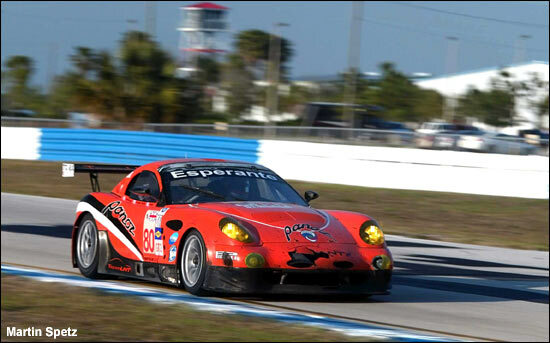 To keep the pace as fast as possible, the drivers would run single stints for much of the race, with the Panoz getting as high as fourth in class early in the event. That attack was blunted however by a combination of minor bodywork damage, as the Panoz suffered contact twice owing to other contenders spinning in front of it, and a grand total of four punctures as incidents around the circuit left dbris on the racing line. There was a drive through penalty too, Richard Dean just a little too eager to get the Panoz back to the pit crew after the first puncture. Throughout it all though the car didn’t fall any lower than its original starting position and, as others hit trouble,the Panoz kept to its race plan and climbed up the order. “I think I’ve broken a rib,” he said as he prepared to climb aboard the car for the last time. The Englishman had been suffering from severe pain after taking a battering over the bumps earlier in the week. 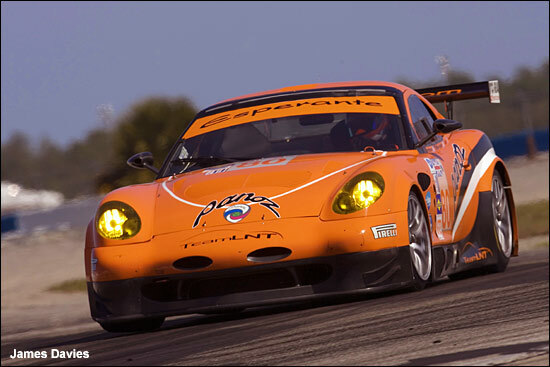 Not only did he take the wheel of the Panoz, he also had to fend off a chasing Porsche and Spyker and was battling hard with a well-driven J3 Racing 911 too. But this Panoz is a tough machine, as proven by Brabham / Maxwell / Bourdais, who didn’t suffer punctures – and came home at the head of the class. In fact it was legendary Porsche reliability that suffered, J3 losing its #79 car with a gearbox stuck in sixth: that meant that the Team LNT Esperante came charging through the darkness in fifth - and when the chequered flag dropped at 10:43pm, with a huge firework display to welcome the survivors home, the #80 car had secured 14th place overall, from 35 top class starters. Team LNT had finished ahead of the other factory backed Esperante but had also humbled several professionally crewed Porsches including both the 2005 ALMS GT2 champions, Petersen-White Lightning, and the 2005 Le Mans 24 Hours class winners Alex Job Racing. In the Team LNT motorhome afterwards the drivers were tired but happy. “I was happy for us to run our own pace and the result proved that was the right strategy,” said Lawrence Tomlinson. “With hindsight we can say that without the punctures, we could have challenged for a podium, but that was a great run for the whole team, and for Panoz,” added Richard Dean. 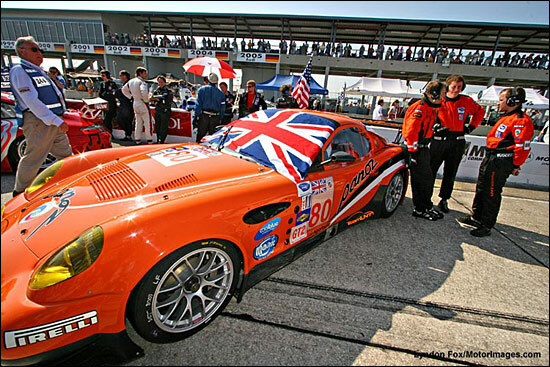 To underline that assessment, Don Panoz then appeared at the door to congratulate the team: fresh from handing around a bottle of champagne to the LNT pit crew, he shook Tomlinson firmly by the hand. 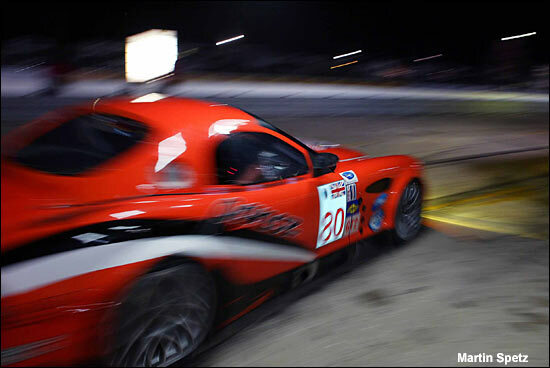 “With the win for the #50 car and your run too it was the best result Panoz has had – so far. I look forward to racing alongside you guys at Le Mans in June,” said Don Panoz (series owner, team owner and all-round endurance racing enthusiast). To put that result into sharp perspective, just consider this. 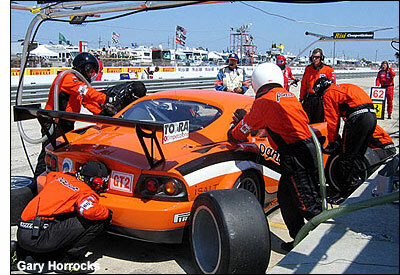 This is the best result for a non-ALMS season regular team at the 12 Hours of Sebring since 2000. That’s some achievement, and some calling card ahead of both the Le Mans Series season to come and the final decision as to whether the team’s second entry gets the nod for the even more demanding 24 hours of Le Mans in June. 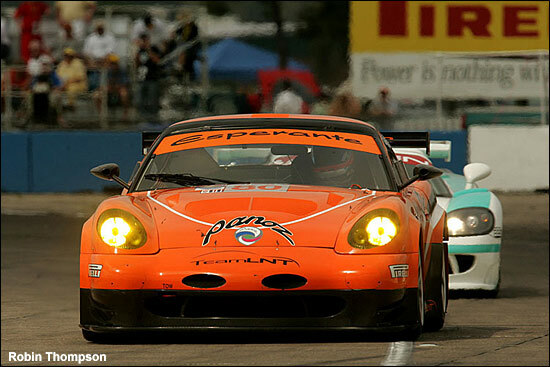 If the ACO want to see a grid consisting of fast, well-run and reliable GT2 cars, they now need to add Panoz and Team LNT (again) to the roll call. Next stop - the British GT Media and Test Day at Silverstone (March 22).